Like thought balloons, key stylistic devices entered or matured in the 1960s. Early in the decade, just as disparate post-Pop and Conceptual artists such as Ed Ruscha, Lawrence Weiner, Mel Bochner, Barbara Kruger, and Jenny Holzer began to make words the primary subject of their imagery, Steinberg began his word-object drawings. Unlike Conceptualists, however, this self-professed “writer who draws” transformed words and phrases into visual equivalents of their meanings. Some of the early examples look like comic book emanata writ large; most of them constitute a lexicon of modern anxieties. Others visualize the literal meaning of the word—the month of March marches off into the distance, while the attenuated ETC recessively repeats itself. February-March, 1968. Ink, crayon, pencil, and watercolor on paper, 21 ½ x 14 ½ in. 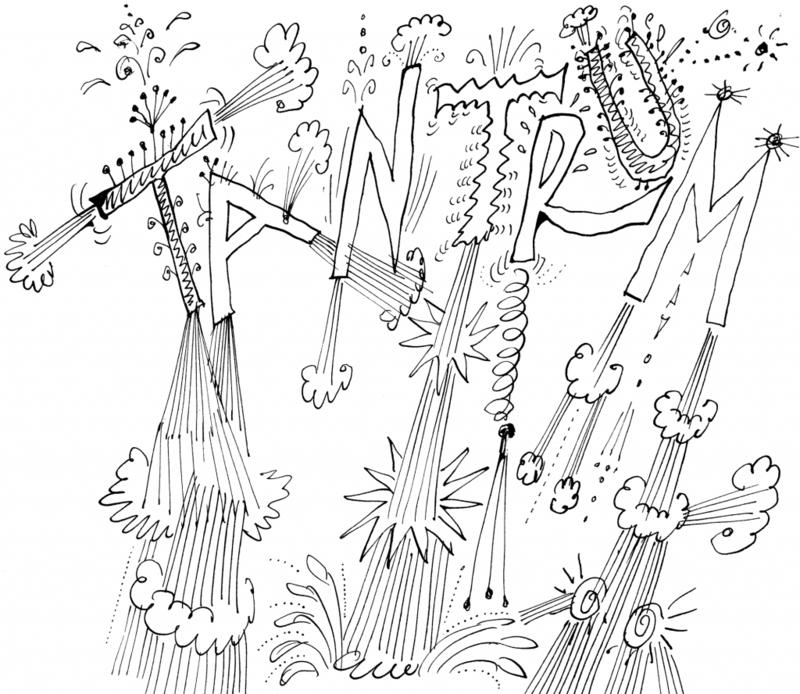 Centre Pompidou, Paris; Gift of The Saul Steinberg Foundation. Colors, used as the cover of the October 21, 1972 New Yorker, may be Steinberg’s artful poke at Jasper Johns’s 1959 False Start and related works. Over a gesturally painted background, Johns stenciled color names in the wrong colors. In the Steinberg, the color words alone comprise the composition, each one misidentified in bold billboard-style letters, perhaps to signal the duplicitous address of advertising promotions. 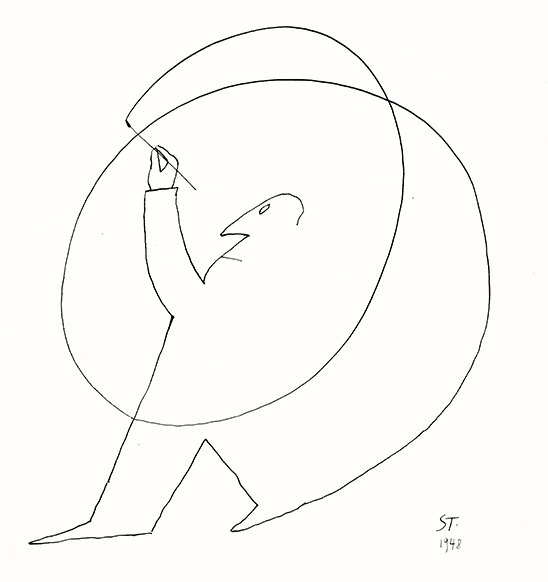 Original drawing for The New Yorker cover, October 21, 1972. Colors, 1971. Cut paper collage with watercolor, oil, colored pencil, colored paper, and rubber stamp on paper, 29 ¼ x 21 ¾ in. Centre Pompidou, Paris; Gift of The Saul Steinberg Foundation.